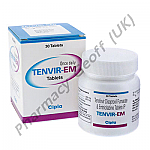 Tenvir-EM is a combination therapy used as part of a HIV treatment plan to treat HIV infection or to reduce the risk of contracting a HIV infection. It contains two different HIV medicines - Tenofovir Disoproxil Fumarate and Emtricitabine. Tenvir-EM dose not cure HIV or AIDS. 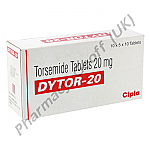 Torsemide (Dytor) may be taken in order to help reduce that fluid amount that is being retained in the body. Edema is a very serious side effect of many health concerns. This is a condition where the body is retaining too much water and salt. As a result, the arms, legs, and the abdominal region can be very swollen. This can make the heart, the liver, and the kidneys work harder than they should. 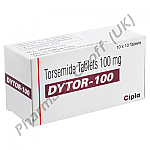 Torsemide (Dytor) is a medication that can help to reduce the swelling of the extremities and the abdominal region. There are various healthy conditions that can result in the body retaining too much fluid. This health concern is called Edema and it can be due to problems with the heart, kidneys, or the liver. Sometimes, Torsemide is also given for those with high blood pressure that haven’t responded well to other forms of medicine. When a patient doesn’t respond well to various forms of medication for hypertension, the use of Torsemide (Dytor) may be considered. This is because it can help to reduce the swelling around the arms, legs, and the abdominal area. It can also help to reduce the amount of water and salt that the body is retaining.